Spyware Terminator will effectively remove spyware, adware, trojans, keyloggers, home page hijackers and other malware threats even dangerous threats like WebRebates, Look2Me, BetterInternet, VX2, and CWS. It is easy to use, requires minimal PC resources and has ultra fast scanning speed. Protect your computer with powerful real-time protection shield, advanced system scanning and safe quarantine for found spyware. Scan your computer manually or schedule full system sweeps. Perform in-depth scans of your computer's hard drives, memory, process, registry and cookies to seek out and remove all known spyware threats. Real-Time Protection guards your computer, privacy, and personal information. They made huge improvement and this app is actually good. It got regular updates, resident shield, usefull tools and not slowing PC at all. Scans are pretty quick. There is still something to improve, but they are on good way. The download site was blocked by Malwarebytes.. Intriguing to say the least. Excellent scanner. Doesn't miss anything, runs unobtrusively with a small memory footprint. You can choose to opt out of the Crawler Tool Bar. Nice GUI, options are easy to find. I'm using an older version, which I like, but I'm afraid to update because newer programs tend to be bloated and interfere with smooth uninterrupted system performance, and obscuring my screen with advertisements or soliciting. Would be nice if it only updated needed portions similar to good AV programs. Have also used one of their other products called System Protect and liked it but don't really need it. I would have to be burnt at the stake & boiled for soup to install this. BTW me not had any um virus in last two years. Me um no excited when I saw this piece of junk. Install it if you want, just don't think it's easy to uninstall. BTW:- PankajTTT's only post, I smell something fishy. I m searching a realtime protection for free but clam dont support it. I was excited when i see that i can have it with Spyware Terminator . From Last 2 years i m using it. all Virus are cleared,when i put any infected usb it clears it. it can provide good modes like install , game ,deny modes. u can switch modes easily. I can run it in my laptop without any slow performance. Its not bad at all. some guy says about crwaler toolbar. yes its bore me so when installing u are prompted to not to install it just select no. however automatic update process is resource hog , i manually update daily. We even use it on our friends cyber cafe & its the only cyber cafe where u dont get any virus in ur usb/system. This IS BEST EVER FREE SPYWARE & ANTIVIRUS Program i found. The splash screen during installation shows version 2.6.0.0, but afterwords the actual version is 2.8.0.1. 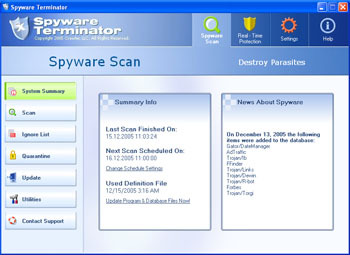 Spyware terminator which actually INSTALL spyware by default (crawler toolbar)... Need to say more? I do not think so. Even if you can avoid it using advanced setup options, the program should help to AVOID spyware: Zero credibility. Common sense is the less common of the senses.. I think this is the best free, stand-alone AS program out there. You can set it loose or tight as you wish. I like it a little loose, so I won't get dozens of alerts. Be deliberate while installing it, because it has an option to install the Crawler Toolbar, which in my opinion is unnecessary. Otherwise, it's a great real time AS scanner, fast and unobtrusive. It's best used with a stand alone AV scanner and firewall. I wish Crawler would come up with a complete secuirty suite like the Comodo Internet Security Suite, which is also free. Whenever a software vendor makes their product almost impossible to remove it becomes MALWARE... Spyware Terminator does not follow the Microsoft rules for product removal and is INTRUSIVE... I have lost many hours eliminating this INFECTION from CRAWLER.